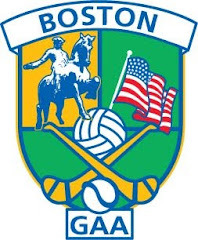 The Boston Shamrocks retained the Orla Benson Cup with a mostly one sided victory on Sunday afternoon. After Ciara Murphy opened the scoring the remainder of the first half was mainly one way traffic. The forward running of Claire Kenny from wing back was kept Connacht Ladies on their heels, while the finishing of Tessa Crowley widened the gap between the teams as the game wore on. Connacht Ladies made a much better fist of things in the second half, and had they taken their chances the final score would have been much closer. The first half saw Crowley net on two occasions. The corner forward was played in nicely by Ciara McCormack and made no mistake with the finish from close range. The second came in similar fashion late in the half, and again there was no hesitation from Crowley. Connacht Ladies managed to muster a handful of attacks with a well taken score from Kelly Kenneally the sole reward. It was a different Connacht side that played the second half. It was the Shamrocks turn to spend lengthy spells defending, and the scoreboard began to take on an air of respectability. Maria Kelly, Sarah Clarke, and Jane Ward all hit the mark, and were it not for a good handful of wayward efforts at goal, the distance between the sides might have been within reach for Connacht Ladies coming down the stretch. As it was, the Shamrocks half time lead of 14 points was more than enough of a cushion to see them over the finish line to their second Orla Benson Cup in a row. Shamrocks: Sinead Hession, Michaela Murphy, Stacy O’Dowd, Kayla Foran, Ciara McCormack, Claire Kenny, Laura Kiernan, Shannon Mullen, Ellie Kennedy, Ann Marie McDonnell, Liz McVeigh, Ciara Murphy, Tessa Crowley. Connacht: Jackie McDonagh, Joanne McDonnell, Shannon McAleer, Katie Lynch, Catherine Boyle, Meg Mullen, Maria Kelly, Aisling Kerr, Rachel Tubridy, Jane Ward, Kelly Kenneally, Tara Doherty, Sarah Clarke.